Oroton Drumfire, named after a long-distance desert race horse, was built in the Netherlands across two shipyards, Bloemsma Aluminiumbouw and Jachtwerft Sudsee. Launched in 2007, she is one of the early designs in André Hoek’s Truly Classic range. Which combines the elegance of the 1930’s, with modern underwater hull configurations. She spent most of her early years based in Spain, where she cruised the waters of the Mediterranean and competed in numerous regattas including the Palma Superyacht Cup, which she won in 2011. Arriving in Australia in November of 2015 she’s now based in Sydney at the CYCA and is very active on Sydney Harbour, taking part in local twilight racing and offshore races on the east coast. “The boat is sailing really well since a wide range of upgrades have been implemented. Our crew are a great bunch of guys and girls who know the boat well and really enjoy sailing together. 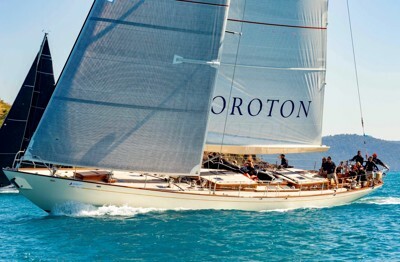 We’re excited to get out the heads and see what she’s got against some of the world’s best yachts and sailors” said Neil.